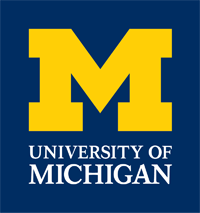 The University of Michigan is a large, research oriented public university with engineering and medical schools; it has access to more extensive technology funding and supports more active digital education programs than does UO. Technology services, generally, and innovative technology and teaching, specifically, have historically been distributed through academic units, however both Information Technology and Services (central IT) and the new Office of Digital Education and Innovation (educational technology and teaching) are actively working to coordinate their areas of activity with parties throughout campus, to build cooperative communities with the goal of creating the “next generation” university. U-M was one of the founding universities in partnership with Coursera, and is currently offering 17 MOOCs. Throughout campus, there are at least 6 online master’s degrees and at least 23 online certificates. The majority of these are in the College of Engineering, through the Integrative Systems+Design program in partnership with GE and the auto industry, but there are significant programs in Social Work, Public Health, Nursing, and Dental Hygiene, plus a sprinkling of online courses across the 22 total schools and colleges. Strategic Scope: DEI and ITS both have clearly defined visions, are aligned with the university mission, and are implemented through cooperative structures with faculty and service providers. The DEI strategic and operational objectives [PDF] are well-developed and useful. Faculty engagement with digital education initiatives is quite high, with clear leadership provided by the Provost’s Office. Faculty involvement is maintained through advisory boards, steering committees, and learner-centric working groups. The five year-old, faculty-led Task Force on Learning Analytics provides significant data on U-M student activity and outcomes, utilized to improve instruction through more efficient technological and pedagogical support. NextGen Michigan and Open Michigan provide data-driven, transparent processes for improving the technological environment at U-M. Despite cooperative initiatives such as DEI, the multiplicity of educational technology units across campus requires continuous efforts to develop effective coordination. The limited standardization of online policy and structures means there is a wide-variety of online or technology-enhanced courses and programs, with availability and quality varying across all academic units. On May 29, 2015, UO staff (Andrew Bonamici, Kassia Dellabough, Kirstin Hierholzer, Lindsey Freer, Greg Milton) conducted a conference call with Mike Daniel, Director, Policy and Operations for Digital Education and Innovation, and Scott Mahler, Director of Digital Learning Initiatives, to explore the dynamics of change and development in technology-enhanced programming at the University of Michigan in greater detail. Three questions were used to frame the discussion, which then developed along lines of interest for the participants. The establishment of the office of Digital Education and Innovation resulted from a combination of factors: preexisting ed tech units in need of coordination, pockets of positive activity happening at the college and unit level across campus, a faculty task force on learning analytics, and a mandate from the office of the provost (influenced to a certain extent by external factors like the rise of the MOOC). Because Michigan is a decentralized university, DEI is envisioned as a tool for collaboration, partnership, and further mobilization, a small and focused team of connectors and promoters that will get the message out across campus and escalate activities happening at the local level. While they have staff to help meet needs not met elsewhere on campus (such as digital artists), their charge is largely to empower the U-M community to produce innovative digital projects, and to foster partnerships between campus constituencies. DEI profiles faculty at multiple stages of each innovative project. 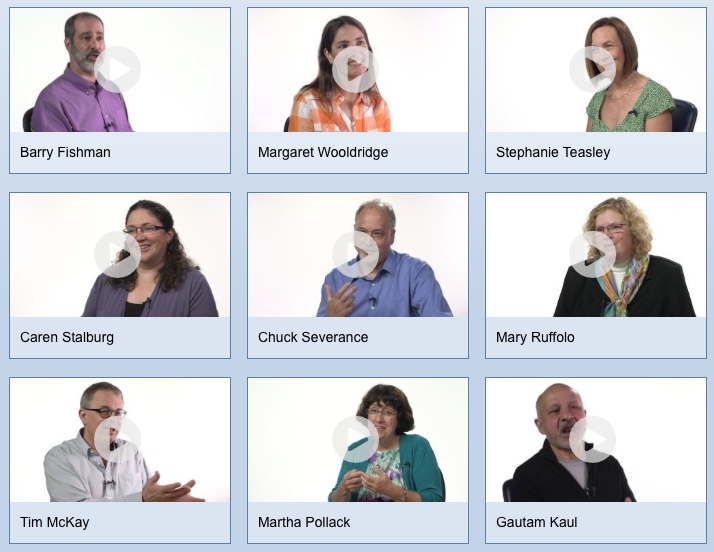 Click here for video profiles of tech innovators among their faculty. DEI hired 1.0 FTE for internal marketing from the outset, the better to grow their local brand and make faculty aware of the office’s existence. The faculty task force on learner analytics represented a body of faculty already interested in exploring tech-enhanced pedagogies, so they are partnering with those who are already “excited” either those connected to the learner analytics task force or the many other innovators around campus. The hope is to use internal communication channels to promote the success of this first round of projects, building stories that will inspire the rest of the U-M campus so that ‘successful’ engaged faculty can communicate with, and serve to demonstrate for, other faculty who are less committed or more on the fence about innovative technology teaching. Faculty are asked to do video testimonials at every stage of their project, in order to create media that can be used to market both that project and DEI as a unit. To that end, the projects DEI chooses to support are those that are clearly mission-aligned and in tune with their local culture (though they will work with faculty in the planning stages to shape a project proposal to those ends). While they are developing digital courses, digital programs, and tools, their focus is on technologies to enhance the residential campus experience. Faculty partnering with DEI are asked to describe the impact their project will have on the local community from the outset. The learning analytics task force is the origin point of DEI’s data-driven ethos; this approach resonates with their scholars. They also have a faculty advisory group, which helps guide their office’s mission, and has become a de facto group of “DEI ambassadors.” (A subset of this advisory group functions as U-M’s digital ecosystem committee, and has become the faculty voice on LMS and other enterprise application issues). In addition to working with individual faculty, DEI is expanding its reach by meeting with college and departmental administrators, and engaging in projects at that scale. DEI has an allocation from U-M’s central budget. It does offer a seed fund for faculty projects, but on most projects they offer more support in terms of in-kind resources than direct funding. They are bigger than an internal grant program, given that they are involved in the entire lifecycle of the project. At this point, there isn’t a standardized funding model for each project, though they will be pursuing revenue-sharing options. Tuition models are decided upon by the partner units or colleges, which ties in with the development of programs (degree, certificate, etc.) online, blended, or traditional by the academic schools and colleges. The Digital Innovation Advisory Group (DIAG), made up of faculty, administrators, and technology managers, is tasked with providing proactive assessment of opportunities posed by changes to the U-M digital educational ecosystem and demonstrate leadership in knowledge sharing across U-M as they catalogue, showcase and apply lessons from innovative experimentation. There are 26 DIAG members, including 14 faculty, 3 staff and 9 administrators from across campus (multiple disciplines, schools and colleges). The advisory group participates in U-M activities designed to advance the institution’s digital education strategy, mine internal innovation, peer institution innovation and competitive forces to proactively address opportunities and challenges, and align with supporting activities. DIAG helps to ensure regular and widespread engagement of faculty, staff and students. The Digital Innovation Greenhouse is a testbed and development space for learning technologies. The six-person project team includes 3 faculty, which “harvests educational software innovations” and helps the small or resource poor innovations grow. The LED Lab is a program to facilitate learning communities (a community of scholars as they state), partnering with other learning technology groups at U-M like the Digital Media Commons, Collaborative Technologies Lab, and the UM3D Lab, and facilitate projects (there is a link to current projects), papers and presentations, and invited talks. The Digital Education and Innovation Lab is a collaborative learning space located just off campus, for faculty, researchers, designers, production staff, and students to create new digital programs, experiment with digital tools and platforms, explore media production capabilities and discover new pedagogical techniques.